Last week, I did a little flashback to a post I had written absolutely fear and how it will grip you and hold you hostage if you let it. Today, I wanted to give a little pep talk to anyone facing down the universe in some aspect of their life. 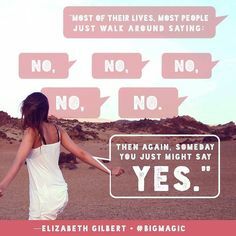 And I can think of no better way than to share some musings about Elizabeth Gilbert and her Big Magic, one of the best pep talks I know! This is an exciting month for me. 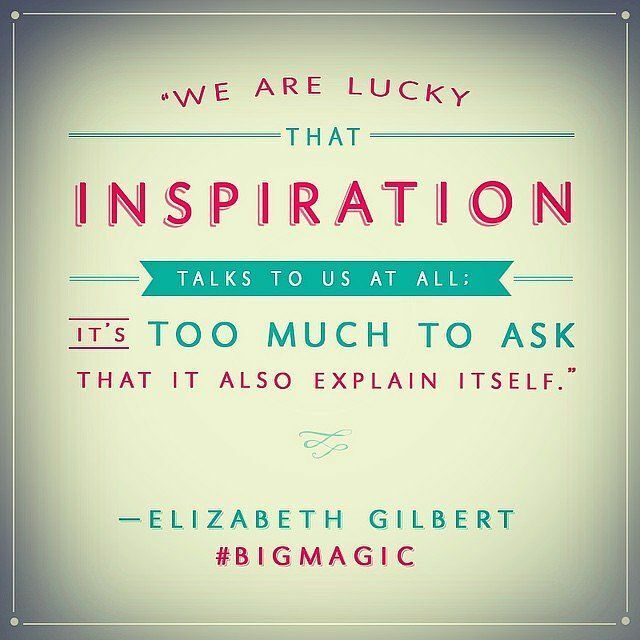 Elizabeth Gilbert’s new book, Big Magic: Creative Living Beyond Fear, is being released! 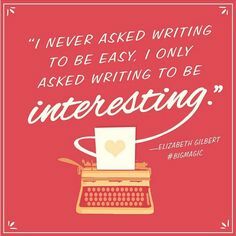 For those of you who are not familiar with Ms. Gilbert’s work, she is the author of Eat, Pray, Love, among other books. I came across a well-loved copy of that book the year after it came out in the lobby of the building where I work. The upper floors of our building are residences and they have a lending bookcase in the lobby. I never brought it back. 🙂 (To make up for my not returning it, I have left many, many, many books over the years!) If you have never read the book, or only watched the movie, please do yourself a favor and pick it up. Now this beloved author digs deep into her own generative process to share her wisdom and unique perspective about creativity. With profound empathy and radiant generosity, she offers potent insights into the mysterious nature of inspiration. She asks us to embrace our curiosity and let go of needless suffering. She shows us how to tackle what we most love, and how to face down what we most fear. She discusses the attitudes, approaches, and habits we need in order to live our most creative lives. Balancing between soulful spirituality and cheerful pragmatism, Gilbert encourages us to uncover the “strange jewels” that are hidden within each of us. Whether we are looking to write a book, make art, find new ways to address challenges in our work, embark on a dream long deferred, or simply infuse our everyday lives with more mindfulness and passion, Big Magic cracks open a world of wonder and joy. “I believe this is one of the oldest and most generous tricks the universe plays on us human beings, both for its own amusement and for ours: The universe buries strange jewels deep within us all, and then stands back to see if we can find them.” Love it! In my journey to publish my first book, I have had moments that may seem small and inconsequential to outsiders, mere baby steps that felt huge to me. They took every ounce of courage I could muster. Contacting an editor, taking a class, outlining a game plan. Just being able to claim myself as a writer was a brave moment for me. Pushing the “publish” button on my first blog post made my nerves dance! Fear is a constant companion whispering you are not good enough, you don’t deserve this, you can’t do this, who do you think you are. Each day I learn to tell Fear to just be quiet and let me concentrate. I am trying to do something here! What is Fear telling you? How do you combat it? 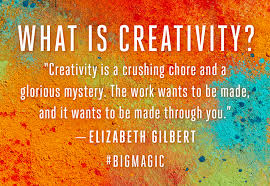 A great TedTalk by Ms. Gilbert on the elusive creative genius!! Enjoy! and another on success, failure and the urge to keep creating!